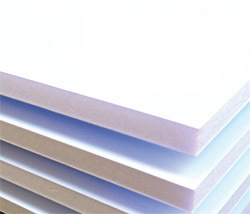 Ryno Board® offers double thick liners as well as high density foam. It provides extra dimensional stability for mounting, display, and exhibit work. The pH neutral surface contains UV inhibitors to reduce yellowing and resists moisture absorption for extra warp resistance. Also available in self adhesive.